The decommissioned French aircraft carrier Clemenceau is heading for India after being released by the Egyptian authorities. It is to be dismantled at the ship-breaking yards of Alang in Gujarat pending the Supreme Court (sc) decision on February 13, 2006, on whether the ship should be allowed to enter the Indian waters at all. 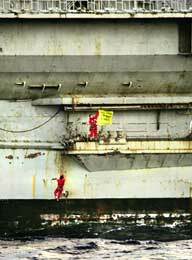 The ship left the French shores in December 2005, amidst widespread protests by environmental groups, who claimed it contained hundreds of tonnes of asbestos. But French authorities have asserted that almost all the asbestos was removed from the ship in France and it now contained only about 45 tonnes of the cancer-causing mineral. According to Technopure, the company initially assigned the task of removing the asbestos, Clemenceau still contains about 500 tonnes of asbestos that can easily be removed without causing serious harm to the ship. The environmentalist lobby have also invoked the Basel Convention of 1989, to which France is a signatory. It bans the trans-boundary movement of hazardous wastes. This prompted the Egyptian authorities to prevent the ship from entering the Suez Canal on its way to India. But it was argued that the convention did not apply to "war material" that the ship is claimed to be. Meanwhile, a sc monitoring committee has asked the Indian government, the Gujarat Pollution Control Board and the State Maritime Board to prevent the ship from coming within 220 nautical miles of the Indian shores. The ship is expected to reach the Indian coast around mid-February. The Union ministry of environment and forests has claimed that India possessed the necessary facilities and infrastructure to dismantle the ship. The vessel is important for reviving India's declining ship-breaking industry, which earlier was the largest in the world. Yet the condition of the workers, who work without any protective gear against toxic substances, continues to be deplorable.